Like many Columbian towns, Pasto in the Narino Department (province) has a number of coffee growing areas that produce some great Central American beans. Farming coffee in Columbia is no picnic, and from time to time those who farm in the area are rudely interrupted. 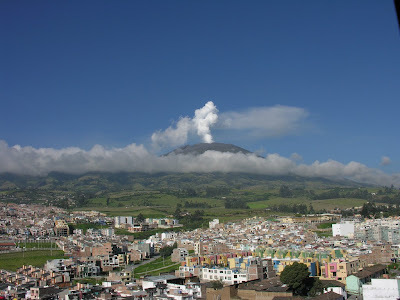 In Pasto the name of the interruption is Galeras. Of course it is more of an eruption than an interruption because Galeras is a stratovolcano - and currently active again. In 1993 six scientists died during an eruption as they attempted to collect gas samples for analysis. If you are enjoying a nice cup of Central American coffee today - and Columbian coffee in particular, spare a thought for the farmers who grow it in the shadow of a mountain that is very much alive and kicking.